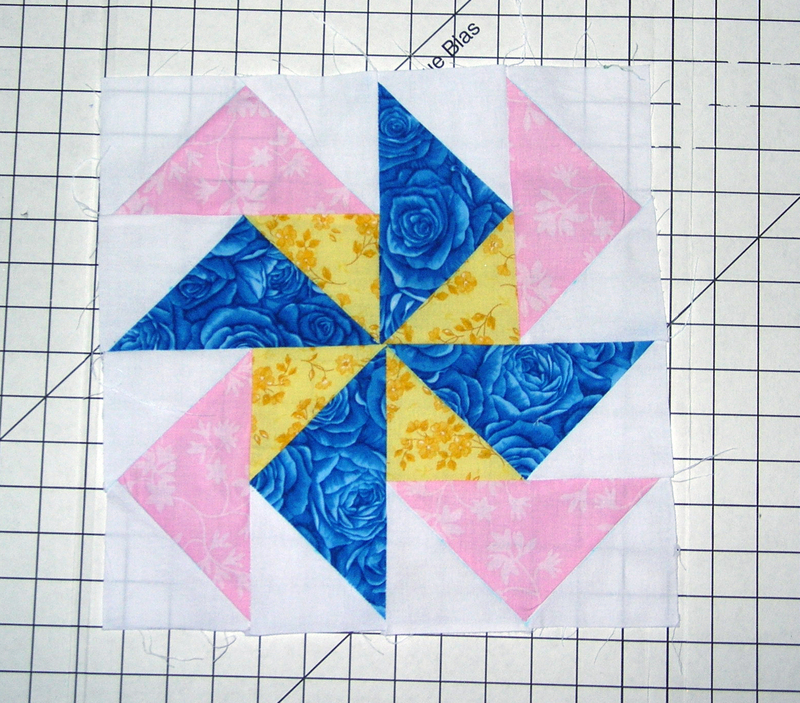 For the fourth block of the sampler, I chose to do a half square triangle version of the Lemoyne Star, called Sarah’s Choice. I love the Lemoyne Star, but the set-in seams seemed daunting, so I love that I got to play with the look of it with a much simpler construction using the half square triangles. I modified the pattern a little bit to include all four of my colors, namely by using two backgrounds. 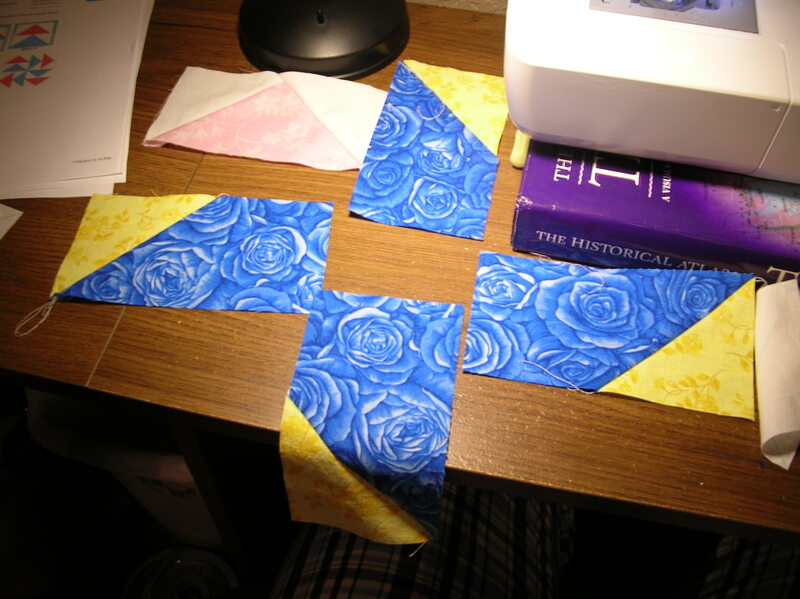 This meant an even easier block because I used all HST instead of having flying geese units on the sides. I like simpler! I made four of these units, then combined into the full block. I learned a lot about getting seams lined up on this one. 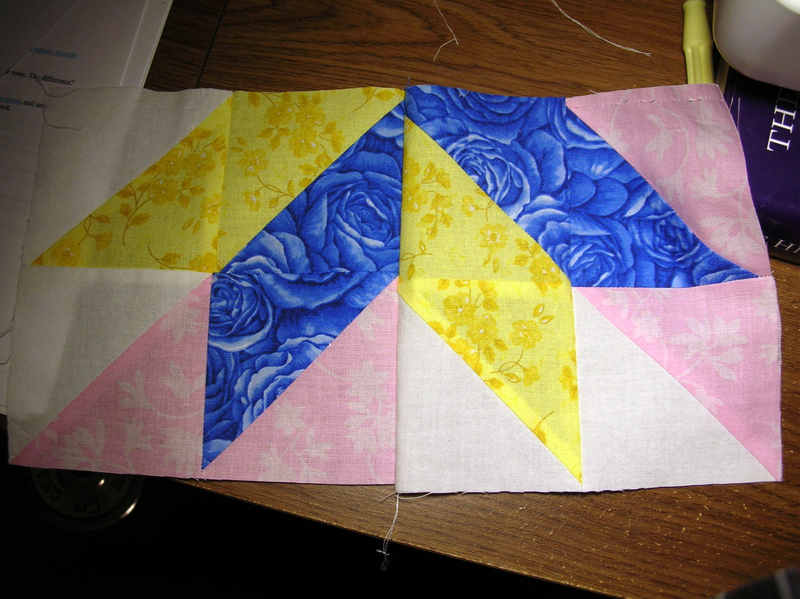 My seam ripper and I are much better friends after this block! 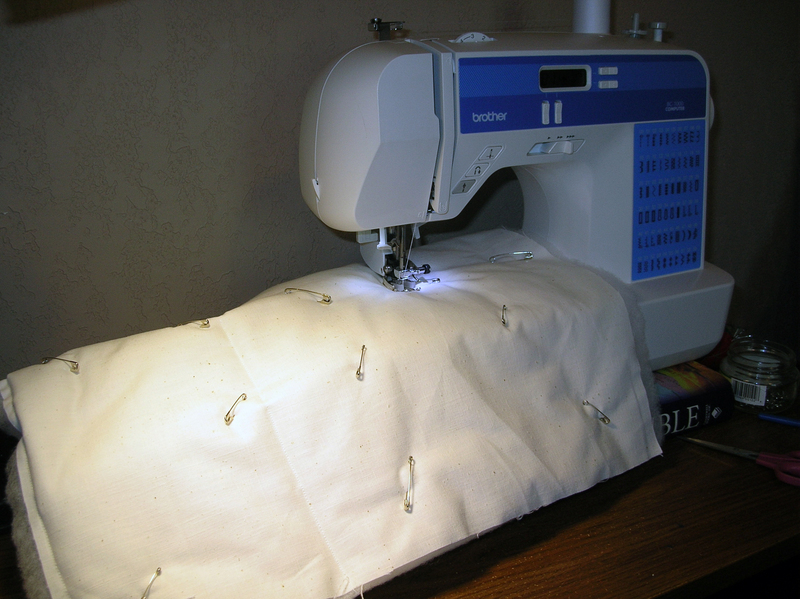 Here’s an example of how NOT to sew two quarters together. 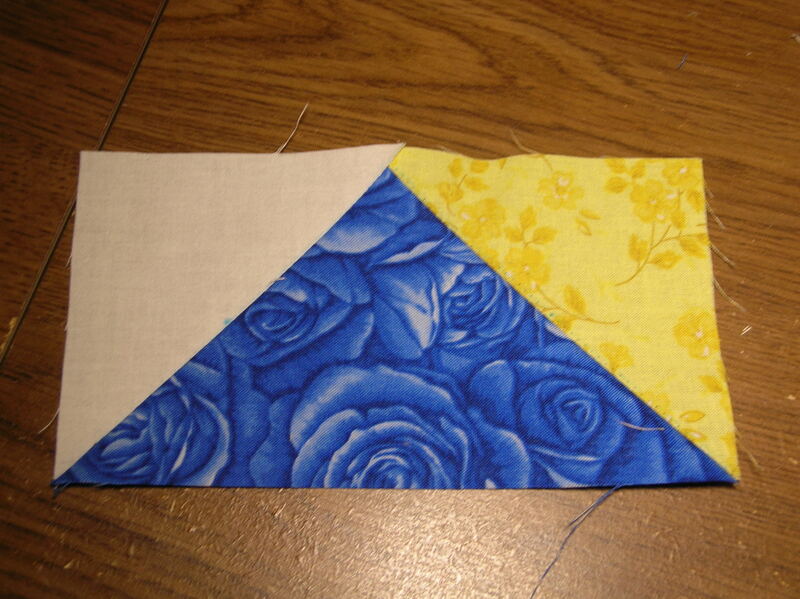 After all the sewing and seam ripping and re-sewing was done, here’s my completed block. For the more astute of my readers, you may have noticed that this completes the list of blocks I’d originally decided to make. So am I done? Oh no, of course not! There’s been some scope creep on this project and I have ideas to make it way better! (hopefully) Stay tuned for more Spring Chicken Sampler still to come! The third block is completed! 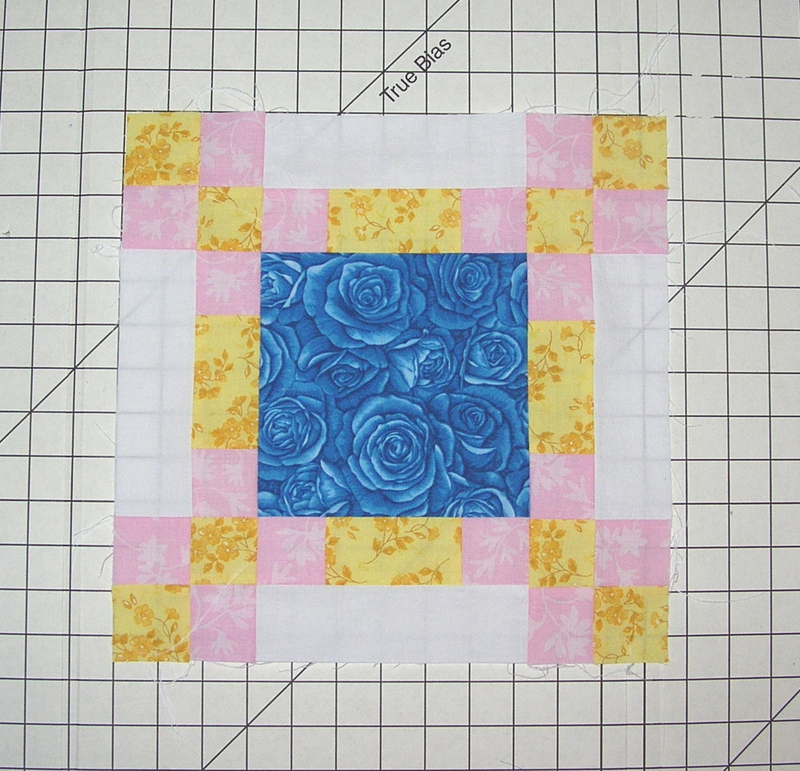 This block is called the Rosebud block. It’s not the traditional rosebud block, but I believe the author refers to it as the Kansas City Star Rosebud block. If you’re not aware, the Kansas City Star newspaper is famous in the quilting world for having printing a weekly quilting block from the 1928 to 1961. Here‘s a little article that gives some historical information about it. While I’ve yet to find one authoritative source, I have found several different compilations that look interesting. 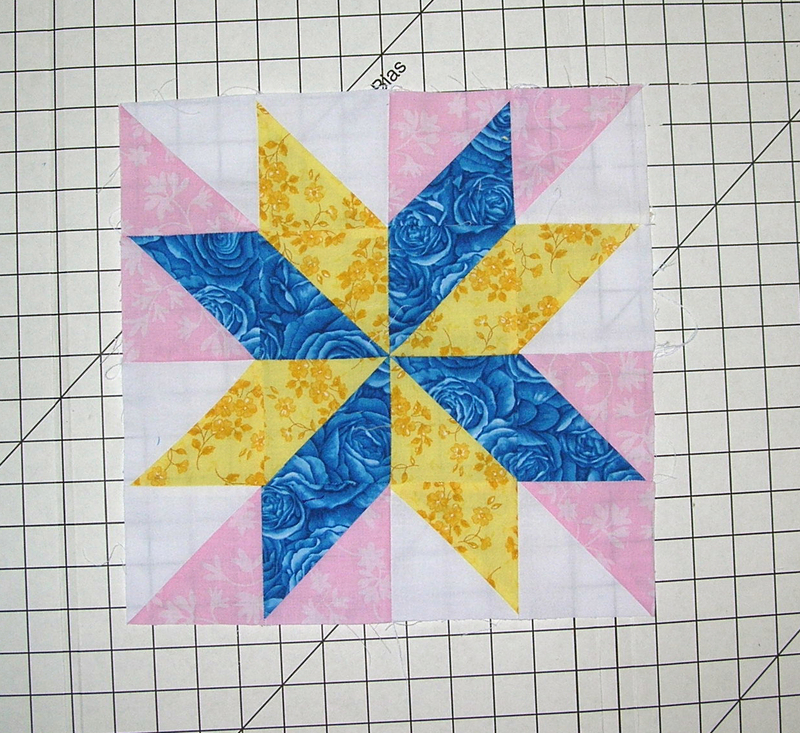 My top two are Star Quilts and My Stars. After all that, I’m still not completely sure that’s where this block came from. I haven’t been able to track it down exactly. For all I know, this is a completely original pattern by the lady who wrote the article. Anyway, now that we’ve journeyed there and back on that tangent…. 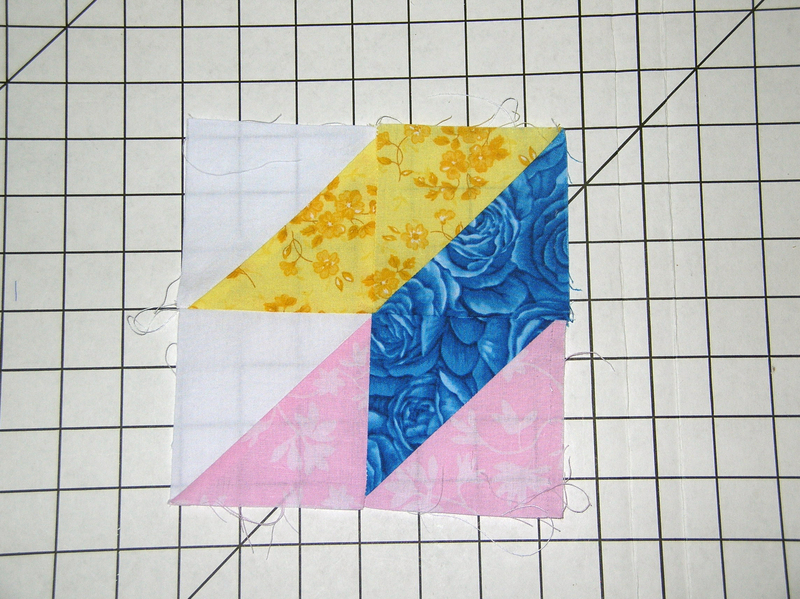 This block is a very straight-forward block, so even my beginner skills didn’t have any issues. 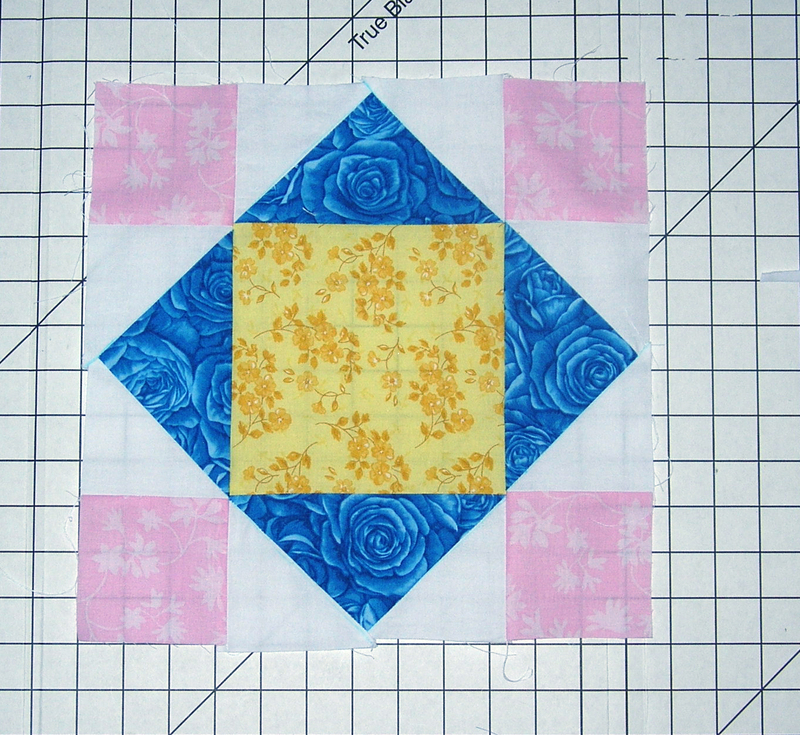 Without further ado, here’s my Rosebud block. 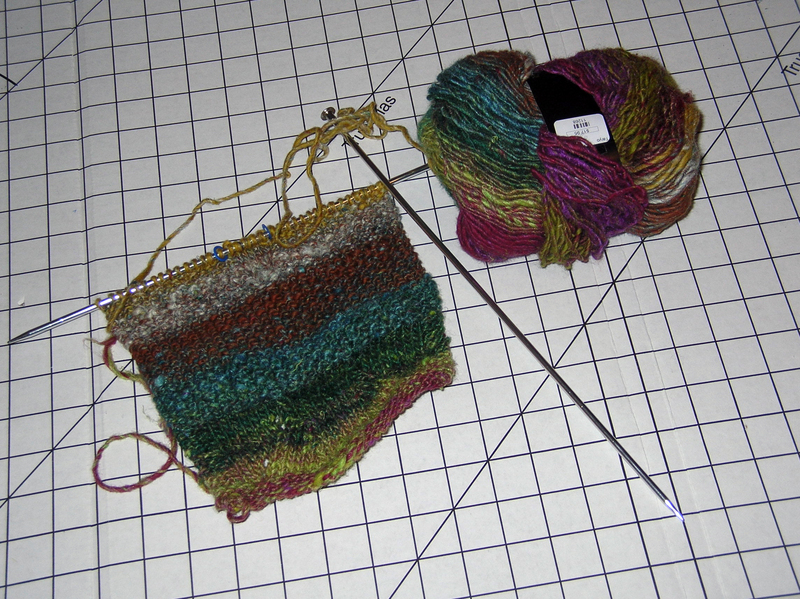 Well, from the look of this blog, you might think that I’ve given up any kind of crafting. Not in any way true. However, my time has been taken up by some other fun things, just not crafty things. So here’s a project update, maybe a “cheating” one, but it’s a true update of what I’ve been up to. School! I’ve just finished Spring I term. For those unaware, I’m working towards a second bachelor’s degree in Computer/Information Science. Fun. Sort of. Anyway, this term was Calculus and Java programming. Of course, the programming was a blast, but calculus just about beat me up. I did win in the end, but it was a tough fight. House hunting! Love this! We’ve picked the most awesome house in the world to buy. We’ve been working for the last 3 weeks to get all the details finalized and are hopefully going to close on Apr 2. Prayers going up and fingers crossed! Church! I’ve been leading a women’s class at church on Sunday mornings (9:00 at Living Hope, for those in the area.) While this is very rewarding, it’s also a bit stressful as I’ve never really done a women’s class before. I’ve taught bible studies based on other people’s books, but this is a good bit different. Not bad, but different. God is teaching me lots of things through it! This stuff alone (along with work, of course) has had me pretty booked for the last couple months. Here’s to having some free time! I did squeeze a little project time in this last weekend, as it was the first weekend I had with no homework! Yay! While I thought I’d be a machine on my first Saturday with some time to craft, I ended up just being so excited to be working on stuff, that I bounced from project to project. It was a bit therapeutic, I think. My brain needed to just unwind and unfocus and breath. Not that brains breath, but you know what I mean. Thanks for listening to my life story from the last couple months. 🙂 I hope to get back to crafting updates soon! 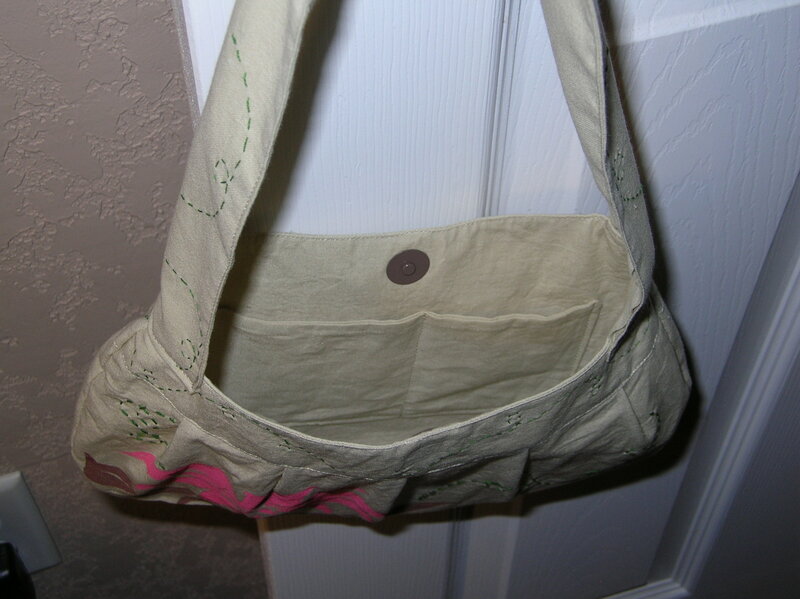 A friend on Facebook posted photos of a purse she’d made that I thought was the cutest! I asked for the pattern, and she pointed me here. I showed this purse half done in the President’s Day post. Now that I’ve finished, it however, I thought I give the background of it. 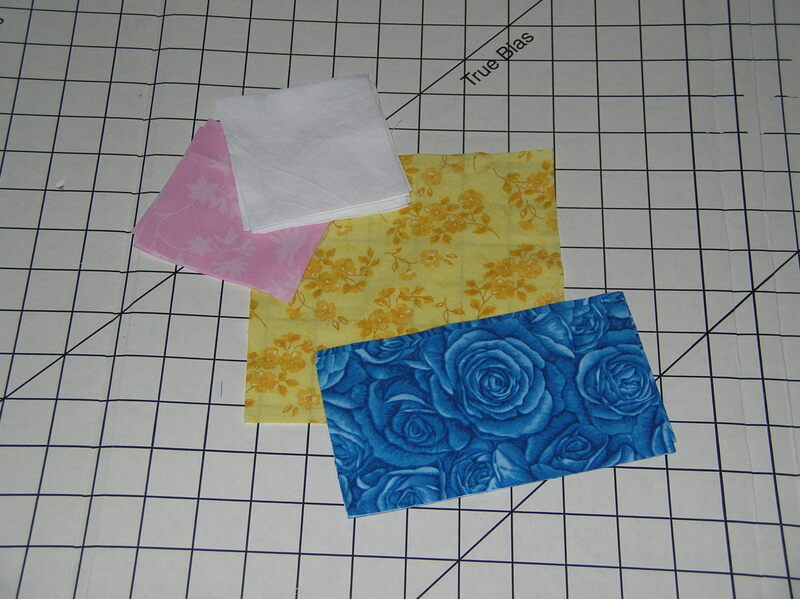 I had bought some fabric recently that I thought would be perfect for the pattern. However, because I have some issues with cutting into pretty fabric (ok, I admit, I just have fabric issues in general), I decided to make a “prototype” purse first. I had some plain fabric sitting around that would be perfect for it. 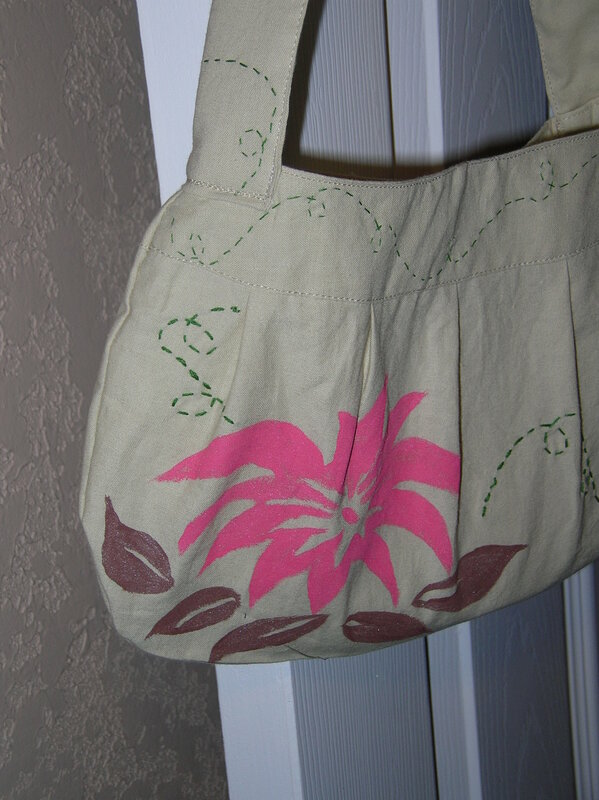 Of course, plain fabric is no fun, so I decided to embellish a little bit… 🙂 The flower was free-handed on and then painted with fabric paint. The green lines are embroidered on. I’m actually very glad I did the prototype, even though I’m still laughing at myself for my quirky fabric issues. 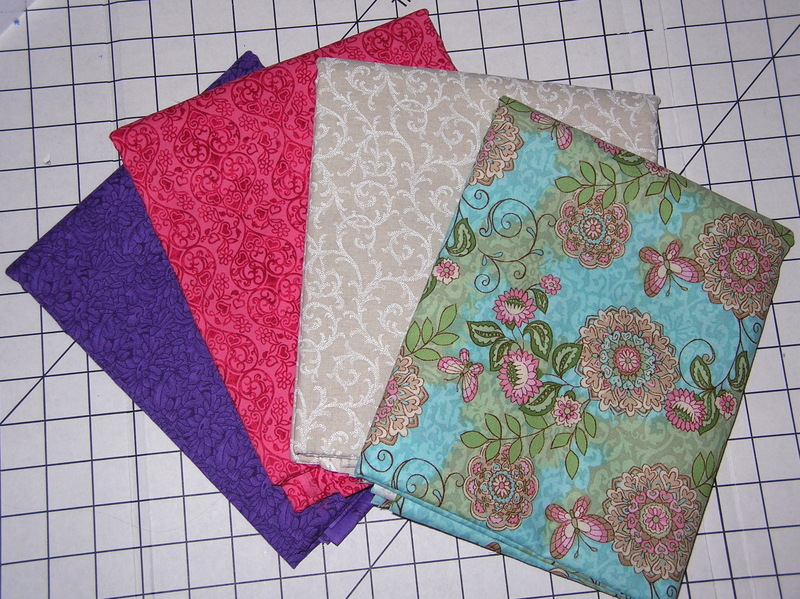 The purse, while overall being great, has some things that I’d like to change before I use my pretty fabric. For one, the handle is too wide; I’ll probably cut the width in half next time, and I might attach it differently than the direction call for as well. 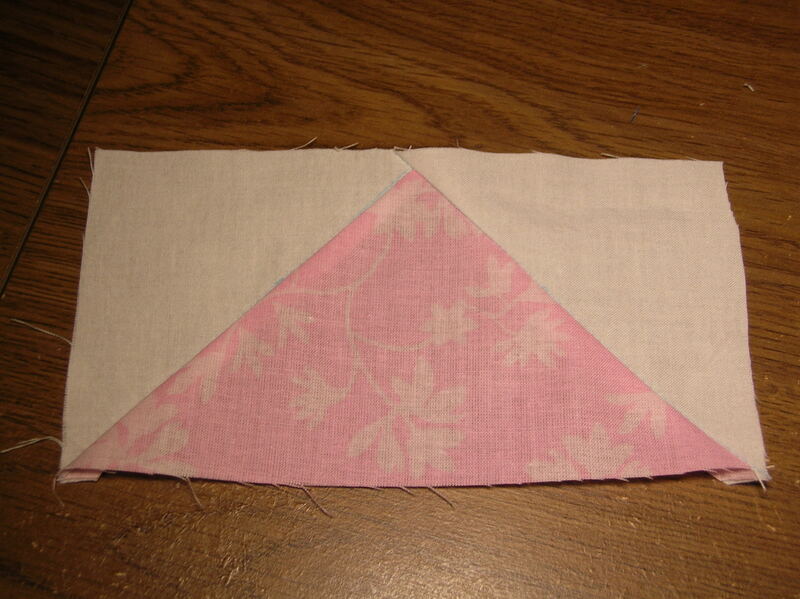 Additionally, I added a pocket on the inside, but for the next one, I’ll add an inset zipper pocket as well. 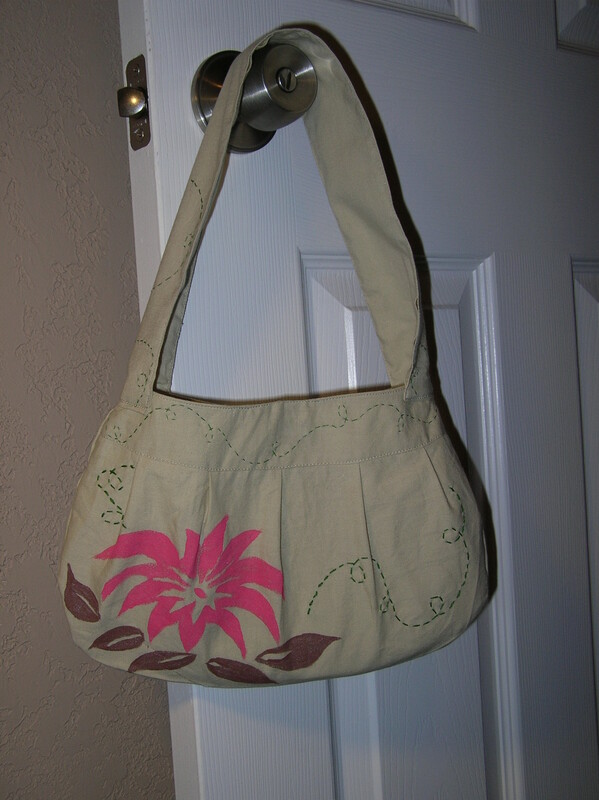 In any case, the purse was fun to embellish and I think it turned out pretty and cute over all. I’m not sure it’s my style completely, but maybe I’ll carry for a casual evening out in the summer or something.